Tour nearby Kentucky bourbon distilleries and you’ll not only learn how bourbon is made, but you’ll start to understand why the “good old whiskey of old Kentuck” has inspired pride, passion (and even poetry) among Kentuckians. Read more about Bourbon Distillery Tours. Keeneland is is one of the most genteel and beautiful horse racetracks in the world. While Keeneland has live racing for three weeks in April and three weeks in October, visitors are welcome year-round with plenty to see. Read more about Keeneland. Explore our wonderful, historic town of Harrodsburg – the oldest town in Kentucky! Walk from Beaumont Inn to the nearby downtown, through a historic district with grand homes. And tour the Old Fort Harrod. Read more about Harrodsburg. Shaker Village of Pleasant Hill is the largest historic community of its kind in America. Visitors to this National Historic Landmark enjoy a wide variety of activities, including self-guided tours, riverboat excursions and special events. Read more about Shaker Village. Kentucky Horse Park is a working horse farm with 1,200 acres surrounded by 30 miles of white plank fencing. The park is like none other in the world. Dedicated to man’s relationship with the horse, the park features two outstanding museums, twin theaters and nearly 50 different breeds of horses. Read more about the Kentucky Horse Park. Also, read about touring area Horse Farms. Perryville is one of the most pristine battlefields in the nation. On October 8, 1862, 18,000 Confederates clashed with 20,000 Union troops on the hills outside of Perryville. Nearly 8,000 soldiers were killed and wounded in what became Kentucky’s largest Civil War battle. Also visit nearby Camp Nelson. Read more about Perryville Battlefield & Camp Nelson. Just a few miles from Beaumont Inn is charming Danville and the prestigious Centre College. Check out the amazing line-up at the Norton Center for the Arts! Discover interesting shops and museums in downtown Danville. Read more about Danville and Centre College. Find plenty of bargains at the famous U.S. 127 Yard Sale, the longest yard sale in the world! Read more about U.S. 127 Yard Sale. Also, check out the 400-Mile Sale. Enjoy the great outdoors. Read about nearby hiking, biking and horseback riding. And find the best nearby golf courses. Take a winery tour and sample some Kentucky wine! Read more about nearby Kentucky Wineries. Shop ’til you drop! Of course, your first stop should be the Beaumont Inn Gift Shop. After that, find many interesting shops and antique stores dotted around the countryside and in our nearby small towns. See our favorite antique shops. Tour our charming small towns filled with great architecture, local shops and plenty of history. See our list of nearby central Kentucky small towns. For even more things to do in the “big cities,” see our guides to Frankfort and Lexington. Central Kentucky Tours gives wonderful guided bourbon, Keeneland or Kentucky Derby tour to see the highlights of the Bluegrass Region. 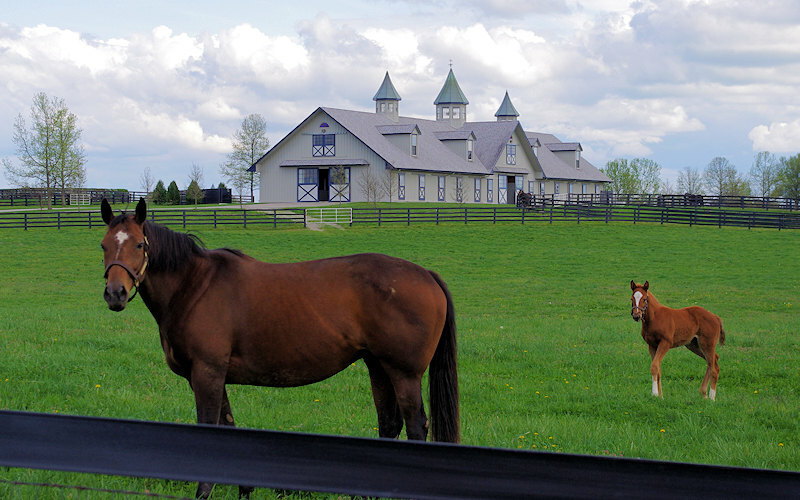 Many of Kentucky’s most noted horse farms have welcomed visitors in the past if they were a part of a professional tour operator, but that has changed! Horse Country is a non-profit consortium of 36 Central Kentucky farms and other equine organizations who have come together to offer the visitor a valued experience. The farms, veterinary clinics and feed mills have great stories to tell about how horses are conceived, born, nourished, cared for and trained to become glamorous competitive athletes. Visit VisitHorseCountry.com for more information and/or book a tour. Come for one of the many area events. Of special note is the fabulous Great American Brass Band Festival.